We had reserved seats on the train from Budapest, and because there weren't many people on board had the whole compartment to ourselves. It was a pleasant journey of about three hours. Subotica is clean, the beautiful old town is near the train station, they serve good coffee. 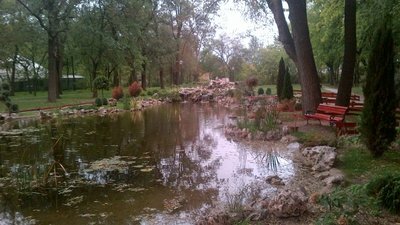 It is located in northern Serbia near the Danube and the Tisa Rivers. It has several Art Nouveau buildings including the Town Hall and the Synagogue, unusual buildings from the early 20th century. The cafes on Corvin Street are beautiful, inexpensive delights. Subotica has the best coffee culture so far as the cafes are really attractive, good service, well dressed, well groomed patrons, (except for us) and smoking everywhere, on the patio and inside the cafe as well. Keep in mind that this doesn't bother me and Jeff smokes so it was nice for us as we spend a fair amount of time on wifi at cafes. And the prices are amazing. The cappuccinno is served, cup and saucer, little doily, dainty spoon, maybe a chocolate, maybe they also bring a glass of water, speak English, our kind of place. One dollar for one cup and oodles of atmosphere. The main square has wifi and is pedestrian friendly. 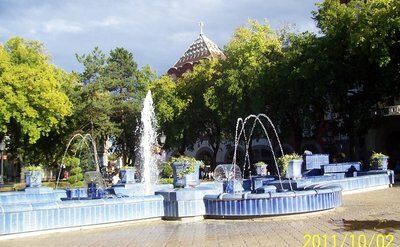 Cars drive on the sidewalks and boulevards throughout the area including Lake Palic which is 8 kilometres east of Subotica. We did take a taxi there but took the city bus back. 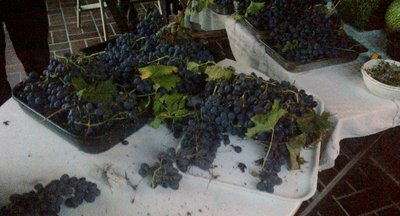 Well loved wines from the sandy local region are served here. We stayed the first night at an airbnb at Lake Palic just outside of Subotica. Tom and Iona. He was Croation and spoke good English, she is a retired doctor, Hungarian, learning English. Subotica used to.be part of Hungary. Now those of Hungarian descent can have dual passports and Tom has three, Serbian, Hungarian and Croatian. He speaks these languages as well, you have to be able to speak Hungarian to get the passport. Their daughter lives in Belgium, just got married in Sept, her husband is studying medicine there, she works in animation with puppets. I thought Tom was saying puppies and Jeff understood it as poppies, an interesting conversation. We were served Turkish coffee and got a ride into Subotica in Tom's restored 1956 Mercedes, 17 metres of leather in the interior. They also had delicious sweet grapes and Iona makes apple and cherry brandy, we had to try some, it was good. We were served a special dish with cheese inside like a phyllo or puff pastry crust, Tom went specially to the bakery to get it for our breakfast. Although it is something of a national dish we have sampled a version of this in Romania as well - burek, brought north by the Turks but I suppose each region or country added a little twist to it. Warmed me up, it was pouring. We took the bus into Subotica with Iona at 1230, 60 cents. Had lunch at the Boss Cafe, (had lunch and supper there yesterday), nice place, gorgeous patio and the inside has china cabinets full of ornaments. We had been invited to couch surf with Melinda but wifi was down through the main square so I couldn't contact her. Luckily we found the American Corner at the library, tourist information told us about it, paid for by the U.S., magazines, books, free use of the computers, and the staff there phoned her for us. Melinda came right away to get us, put our backpacks in her car and took us for a walking tour. We walked to the town hall where everybody gets married, a civil ceremony required, beautiful venue. Then you can also get married in a church like St Therese on the square, really pretty inside with kind of aqua coloured walls and lots of paintings. 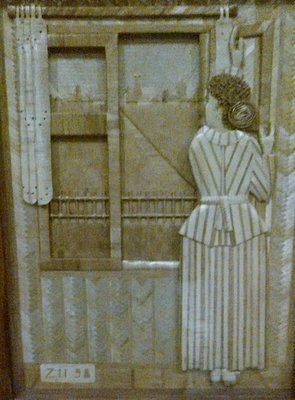 In the lobby of the Town Hall there were several detailed pictures, done in wheat. Very intricate work, a craft here. We walked by the second largest synagogue in Hungary, impressive, but in an expensive state of disrepair, nobody can afford to renovate it, so it sits empty, nobody uses it, the Jewish people mostly moved to Israel so the fewer than 300 left cannot support this synogogue and meet in a smaller venue nearby. We walked through a pretty park called the Little Woods, then Melinda bought us roasted chestnuts from a street vendor, very good. It had stopped raining hours ago and it was a pleasant evening. We went to her place where we each got a room, clean, spotless, comfortable, lovely single family home. She fed us fish soup and bread and the salty version of the national dish burek in puff pastry, kefir, yogurt drinks too and then to the living room for tea with a cookie, make yourselves comfortable, feel free to help yourself, an amazing hostess. She would go to work at 7 in the morning and at 9 or 930 will come back to pick us up. "we will see inside city hall and then get you to the train"...very, very nice woman. We each had our own bedroom, so comfortable and clean. Melinda is Hungarian. She gave us apples to eat on the train, very generous and thoughtful. We take her for a quick coffee at a super nice cafe she shows us, and then we have the train to catch. Too bad I pre-booked the overnight train from Budapest to Brasov, we are sorry to leave Subotica. We part as friends, funny how you can make such a strong connection in such a short time. Couch Surfing - go to couchsurfing.org. People of all ages surf and host, you must be prepared to do both. It is so much more than a free bed for a night and we really were invited by some awesome hosts. We must pay this forward when we get home and have had good examples of what would make a good host. To be a good guest you should bring a gift, help out, be pleasant and clean and express interest in learning about the host and the local customs. If all you are looking for is a free bed, then maybe couchsurfing is not right for you!! On this site you have the opportunity to rate your host and they also have the opportunity to rate you. Then you have references for future guests and hosts to peruse when making their decision whether or not to make a connection.